Detailed information on the financial considerations for Second Suite owners. 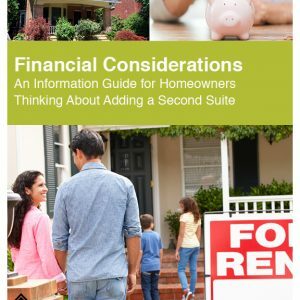 The Financial Considerations Guide contains information about the financial benefits and challenges of owning and operating a Second Suite. It explains the financial aspects that should be considered when creating or upgrading a Second Suite in Ontario. It also includes five case studies from different geographic locations across Ontario, which are meant to explore and compare market considerations and costs related to the creation and operation of a Second Suite.